Jesus is transfigured on Mt. Tabor. Moses and Elijah appear, affirming that He is the Messiah. James and John fall backward from the light, while Peter, as leader of the apostles, shields his eyes and tries to absorb the meaning of the mystery. God wants us, by imitating Jesus and listening to Him, to be transformed by acquiring the Holy Spirit. In so doing, our cooperation with grace results in our becoming more like God. To be God-like, we become loving, compassionate, peaceful, and above all we seek to share God’s truth with others for their salvation. In the Gospel accounts and in 2 Peter’s re-telling, we ascend towards Christ, imitating Him, most especially in His kenosis, His self-emptying through the Incarnation in which He humbles Himself to take on humanity in its fullest -except sin – and so empty ourselves of sin in order to be more like Him. In so doing, we become truly holy, truly changed by grace. In 1973, this was the day on which we buried my father’s mother, +Antoinette (LePrell) Zugger. She was a little lady, with dark eyes, a ready smile, a green thumb, and devoted to her faith. Every morning she would sit down with her novenas and her prayer book and spend time praying. She lost her husband in a railroad incident in which someone threw the wrong switch in the big railroad yards that still surround East Lovejoy/ Iron Island on Buffalo’s East Side, and killed him, back in 1924. My father Henry was all of four months old. From that tragedy, she emerged as a pillar of faith. When we buried her, I was lost in grief. I had learned German from her, spent days living with her as a little one, and had nursed her in her last illness. I was 17 and heading off to college in a few weeks. But my world was shattered when she died. Grandma had remained faithful to the memory of her husband, despite several marriage proposals: “there was never anyone like your grandfather again.” She did not get bitter over her loss, but grew in faith, reading from her “Maxims of Eternity” so much that certain pages are permanently stained from her fingers, with a pile of novena booklets topped by Our Lady of Perpetual Help. Whenever she passed a Catholic church with a funeral Mass going on, she went inside to be sure someone prayed for that soul, and at her funeral St. Paul’s Church in Kenmore was full all the way to the last pew. She grew her African violets, worked hard as a cleaning lady in City Hall, devoted herself to the care of her only son – praying to Our Lady of Perpetual Help for his safety all through World War II and he returned uninjured and with no tropical diseases from the Pacific campaigns – and embarrassed store owners and shoppers into buying tickets to support the church raffles, so much so that Father Gallagher mentioned it in his homily, saying he had no idea who would raise that kind of money for the church ever again. I wanted to know if there was any kind of a sign regarding the day, and so I looked up the Transfiguration as a result. And I saw that this day can, for us, become a day in which to set aside the earthly things, and reach out for the Lord. My grandmother’s soul was on its way to heaven – when she would get there I did not know. But I did know that she was going to have a share in this radiant, shining glory. Ultimately, she was going to be admitted into that transfiguring glory, and when she did, her soul was going to be illuminated with God’s shining Light. And at the resurrection, her body and soul united would shine as well. It is a great feast, a day on which we should really try to find some quiet spot, even if for only five full unbroken minutes, and ponder the mystery of God Become Man, and thank Jesus for His great mercy, but above all, for His awesome love. He shows us Who He is on August 6th, in blinding light, but a light which is healing and not fearful, which is illuminating, for our souls and minds, and invites us to be transfigured as well. Have a great feast! 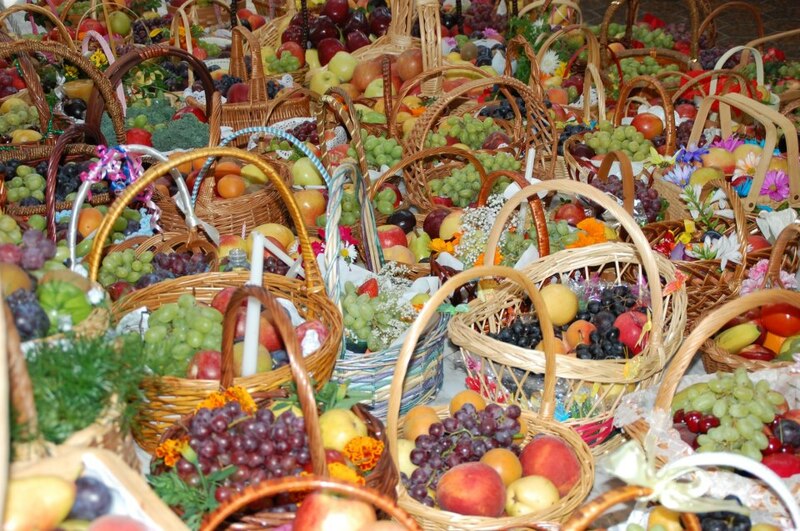 Below you can read about the custom of bringing grapes, apples, and other fruit to church tomorrow to be blessed, and enjoy some icons and photos. In the month of August in the northern hemisphere, fruits are ready for harvest and so these are brought to church on August 6 to blessed for the Transfiguration. In particular, grapes are brought to church, symbolizing the wine for the Precious Blood of Christ in the Holy Eucharist, and apples signify our redemption from the curse of original sin, introduced when Adam and Eve ate from the Tree of Life. Inessa Safronova’s colorful painting, “Apples of the Savior’s Day”, shows blessed fruit waiting to be eaten in a Ukrainian home, with the family icons in the corner lit by a hanging lamp.